We had breakfast for dinner tonight. 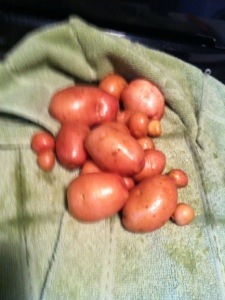 Two days ago, I was curious to see how the potatoes were doing under the heavy beetle burden. So…I dug up a couple of plants. We enjoyed these beauties (diced with onions, butter and a little Cajun seasoning) with smoked cracked pepper bacon and fried egg sandwich on an everything bagel. It all was delicious. The potatoes were great!